In a reciprocal relationship, there is no need for leadership. I believe the biggest, brightest truths are already within us, born in the folds of our brains and the flesh of our hearts and left there to grow. Most of us suspect or intuit these truths, either exploring them with curiosity, or suppressing them if their implications threaten too many of our attachments or beliefs. They lead us step by step (or plague us if we resist) until we find them again; the outer world’s perfect match to our inner knowings, the validation of our truths. And with something like the sentience and cognition of horses – which is the unifying understanding that brings our readers together here – those truths when fully embraced can open new worlds, new ways of being, and sources of peace and growth in our lives. There is something that happens, at least in this era of valuing facts and evidence, when the slow cogs of science catch up and validate those truths – the final permission, perhaps, to believe and sink into knowing something. When I first stumbled across equine ethology, the biological study of horse behaviour (especially as it occurs in a natural environment), I was excited and relieved to find new pathways to understanding, and facts that challenged how I had originally been taught to be with horses. After a long period of questioning and distancing myself from common practices, and then becoming disillusioned with the “horse whispering” scene, it gave me something solid to sink my hungry (and somewhat nerdy) teeth into. It gave me permission and direction. Equus Lost? by Dr. Francesco De Giorgio and José De Giorgio-Schoorl will be that permission for many people. For others, it will be a brand new world. And for many more, it will be a refreshing acknowledgment of what they have known and lived for a long time: that horses are complex, social, and highly intelligent beings that have their own way of being in their own environments, and that in light of this we must learn new ways of being with them. According to the Di Giorgios, horses don’t need leaders, they are not “flight” animals, and they don’t need to be trained in order to learn. Depending on what you believe about horses, this might be heresy – or it might be simple common sense. 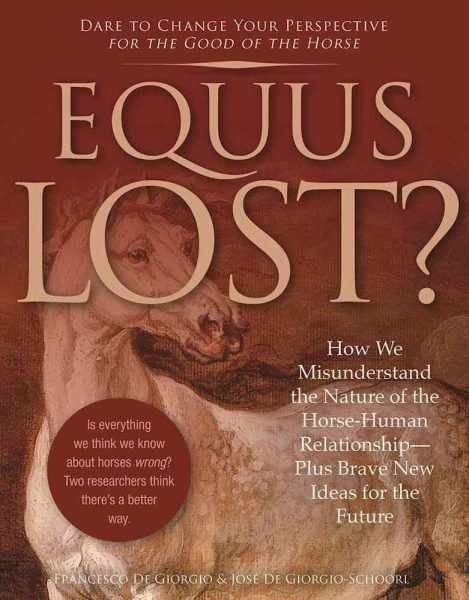 Based in Francesco De Giorgio’s decades of research in Zooanthropology (the study of animal-human relationship) and Socio-Cognitive Learning (the authors’ particular model for being with animals), this book encourages us to step back and approach horses with open-minded curiosity and respect for them as complete beings. It explores the social and cognitive nature of horses and suggests a way of being with them that sidesteps the dominance paradigm, offering a way to “change your approach from an expectation to a shared experience”. I use the term “encourage” because, while straight-forward and somewhat technical, the tone of the book is not didactic or pushy, despite the wealth of evidence that could be used more aggressively to “get the point across” and show just how inhumane, or incomplete, the majority of horsemanship theories and practices are. I get the sense that the authors have consciously avoided shaming anyone, choosing to offer a new perspective to consider, rather than dwelling on what we’ve been (perhaps) doing (quite) wrong. And before you get too doubtful about the scientific approach (if you’re not that kind of learner), I will assure you that there are pictures, stories, and even poems throughout to break up the text. If you have the kind of brain that tunes out around niche-lingo terms like “affiliative and alleviation behavior”, you might struggle a little to stay engaged, but I found the glossary helpful and the pace of the book quite natural and engaging. The part I found most distinctly helpful was their break-down of operant conditioning – also known as “training”. According to the authors, whether you’re using primarily positive reinforcement or negative reinforcement to teach your horse what you’d like them to do, you are, essentially, bypassing the horses’ unique and inherent cognitive abilities. I have explored treat training along with everything else, but like everything else, it has faded out of my repertoire. I could never quite put my finger on why I wasn’t completely comfortable with it – after all, the horses learned quickly, appeared to enjoy the sessions, and certainly there wasn’t any need for pressure or punishment. But somehow my horses managed to communicate to me that, while they sure liked getting pumped full of treats, we were still missing something important between us when we worked only in this way. When operant conditioning is applied in practice, especially after a horse has shown behavior difficulties, the results seem almost magical to the unprepared eye. Horses effectively seem to learn new behaviors quickly. This responds to the trainers’ and owners’ desire to keep things under control, and perfectly meets our need to reassure ourselves we have a horse that we can take care of and that will not cause problems. The horse seems to be a “fast learner.” However, this mechanical and linear method risks damaging a horse’s ability to express himself and his cognitive ability to create his own understanding of a given situation. …In the horse-human relationship, tricks and treats cannot be used to smooth out and reduce tense behavior. They cannot make it disappear or create in its place an emotionally balanced animal. Our desire for obedience, surrender, and specific reactions makes us cover up behavior and doesn’t allow the horse to use his own social skills and inner intentions. Training methods focus on surrender, ignoring the essence of the horse and his social abilities. While I think that negative and positive reinforcement are just small parts of the larger whole – the many, many ways in which any being takes in information and learns new behavior – and not in themselves things we can or should isolate as “wrong” or “right”, I also think that any approach taken to an extreme, and taken out of context, always has side effects. “Training” is essentially taking learning mechanisms out of context and using them to our human advantage. Some people actively want control over their horses, and some want control without punishment. For those of us who want relationship and dialogue above all, and are willing to forego control, it’s helpful to have a framework like this to break it down and go, okay, is this what I really want? Is this method getting me where I want to go? Is this just another way to show off what I can make my horse do? Or do I need to let go and open up further…? Equus Lost? is not a manual or “how-to” book. If you’re searching for a method or specific exercises, you won’t find them here. In a conversation with José De Giorgio-Schoorl, I gathered that she and Dr. De Giorgio were very careful not to give too much or too little in this book, specifically for the benefit of the horses. We’ve all seen what happens when a little bit of knowledge gets into the wrong hands. I am thinking of the pseudo-psychology that has gone into natural horsemanship techniques; the way that one-dimensional understanding of something like equine behaviour has led to exploitation of the horse’s cooperative, social nature. All of a sudden, everyone’s a roundpen trainer. So while the book is rich in fact, theory, and sentiment, it doesn’t leave the reader with anything very concrete in terms of what to do differently, or where to start making changes, though it does drop a lot of hints. I personally appreciate this approach, but I know in other times of my life I would be itching for more from these people. I’d be staring at the last page thinking, yes, absolutely yes, but HOW? Consequently, they do offer an extensive training program, a video series on Epona.tv, and workshops in Europe and the UK. If you do want to explore these ideas further, the video series is definitely the most accessible place to start, though you will need an Epona.tv membership (which also gives you access to all kinds of great videos). Equus Lost? seems to me like a new ground zero for those of us exploring a new paradigm of horse-human relationship – it’s a perfect place to start learning or re-learning about the biological nature of the horse, a concrete foundation to support your ethics and goals, and a wonderful resource to enrich and inform your practice with horses, whatever that might be. Lovely, they have been showing us all along. Howdy there Buckaroo, what I have read so far I really like. I am in the process of reading one called: Horse, Follow Closely Native American Horsemanship by Gawani Pony Boy. Like I say, you eat the fish and spit out the bones. Both have been helpful to me. Will get back once I am finished. Stay warm and the 4 legged and Nature are our teachers. Hi Buddy! Long time no see. Yup, eat the fish, spit out them bones… anything that helps us translate and understand on a deeper level is worth a moment or two 🙂 let us know what you think! Hope you’re well, and your fur family too! Nice to hear from ya. I would propose that there is a difference between rational leadership and dominance –which seems to be what most people mean by “leadership.” In a reciprocal relationship between equals, leadership vacillates from one to the other continuously from moment to moment, from situation to situation, like the constant flowing interchange of yin and yang. “Equal” does not mean “the same as,” and, while the two have some foundational characteristics in common (mitakuye oyasin), each partner brings to the relationship his/her own unique instincts, talents, experience, perspective, intelligence and judgment. It’s like the idea of synergistically combining two foods with different but complimentary amino acid profiles resulting in a “complete” protein. The combination of the partners’ uniquenesses creates a composite being that is far greater than either of the partners considered alone. The relationship they have is predicated upon respect (recognizing, understanding, accepting, and cherishing the other’s unique being), trust (which comes from never disrespecting the other and always acting in consideration of the other’s interest) and affection (which I would describe with a whole host of Maslow’s b-values). Personally, that’s the only kind of relationship I want with anyone, horse or human. But maybe that’s just me. I think the only issue here is semantics. In horse-people-land, like any niche culture, the language gets twisted, subjugated, manipulated at worst; misunderstood or misinterpreted at best. I avoid the word “leadership” because I feel it is so loaded now, and there are more creative and accurate ways of expressing what we’re looking for – as you describe so eloquently above. In my Aikido practice, we are constantly striving to lead and follow at the same time, whether we are attacking or defending – and what a generative place to work from! Mutual respect and trust allow for all involved in relationship to grow and expand beyond all expectation. May we all know the sheer delight and thrill of these relationships. Thank you Adam! Unfortunately, “being incarcerated and chased with a stick,” does indeed appear to be the American idea of freedom. Thanks for posting this Kesia. I found the De Giorgio info on Epona TV and watched their videos a coupe of months back. I am not a current subscriber, but I really loved watching and listening to Francesco (also because he’s Italian, and so am I, and listening to his view in Italian was a delight), and all kinds of light bulbs went off in my head. In the past 11 months with my mustangs I tried different things and I was all hung-ho about this training and that training, and everything I attempted or even thought to attempt felt meaningless….Every time I thought of something, or tried something (even hiring a mustang trainer for 30 days, which was a disaster on so many levels) it felt…empty? I kept coming back to “why am I doing this?”, and “who is it serving?”. After all, we don’t meet someone (human) and start trying to control their movements and their lives. But we do it with animals. And I’ve finally started asking myself the question: WHY? Because we can. That’s really simple, isn’t it? We hit children because they can’t hit back, until they get old enough to fight you (I speak from experience). We control horses because we’ve learned it’s possible. We are on this planet to learn about power and this is one way…and most of us are still in the “dysfunctional practice mode”. Horses are such energy masters. We can learn so much from being in their presence. But we have to be present too. They call us to that, right? I am excited to red this book, I just ordered it!! Thanks for posting! Right! The more we can stop and think, what am I hoping to get from this, the better. I did just like you and tried everything under the sun, at first thinking there must be something wrong with ME, for not understanding or not relishing the results. My horses showed me how little they enjoyed any of it. It was devastating…until I realized there was a whole other approach that resonated more. That didn’t include meaningless expectations and abusive motivations. If your horses are like mine, they will understand on some level that you have been doing your best and you will continue to learn and grow. And be present. Because in the end, why are we here, if not to be…here? And they remind us, call us to it as you say, every day. Like right now I can feel Fly burning holes into the side of the log cabin with her beady little eyes ? …she wants to go on a meditation walk I keep promising before getting too human and busy and forgetting. Much love to you and yours on your way through this life. Keep us posted! Rachel I have the biggest smile on my face reading this and I really can’t wait to hear more from and about you! Thank YOU for all the love and for joining in to the big chaotic fray of all that is exciting and unknown and totally fascinating about life on earth (specifically with horses!!) … if you’re open, I’d love to hear a little about you and your horse friends. I have been feeling the same Rachel… So it’s nice to “meet” you too! It’s such a strong feeling to sense this kind of resonance with other humans… Reading the blog post of the week is part of my sunday morning ritual (like my mass), it often brings so much relief to feel understood, to feel such kinship with others even if they are spread out all over the world. Love to all of you horse listeners out there! Capucine you add so much thought and wisdom and love and firey spice to this community…thank you for all that you bring! Happy New Year and big hugs your way! HAPPY NEW YEAR TO ALL THE HORSE LISTENERS. ? Wanted to say how wonderful it is to read Rachel’s comment. It is a very comforting feeling knowing we are not isolated in our different array of feelings and interactions with horses. 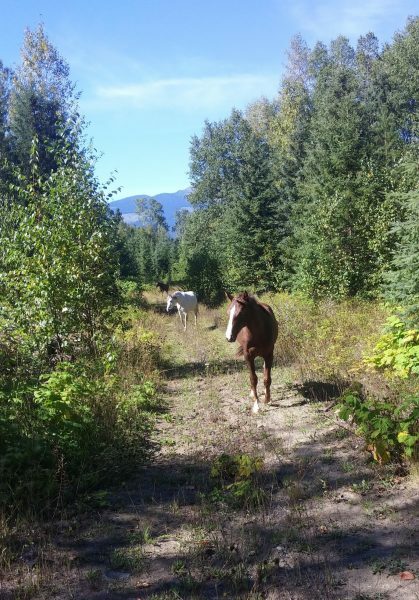 Although we all… are of course …in varying situations and circumstances we all seem to have this longing to follow what resonates with our authentic selves and our horses. This blog and all the community that goes with it ….has been such a source of comfort, peace, knowledge and pure happiness for me. I am so grateful you gals keep putting it out there and letting all of us be a part of it. Here is to listening and learning from the best teachers ….THE HORSES✌?️❤️? Oh it’s not about “letting” at all…this just wouldn’t be happening without all of you who are a part of it! Thank you for all your insight, validation, love and celebration this past year…here’s to whatever fun next year brings! ??? What an inspiring article and comment thread! This gives me hope that my dream of living with horses isn’t as “weird” as some people make it sound!